With the limited, surprise release of the “Red October” Nike Air Yeezy 2, it would appear that the Air Yeezy legacy has officially ended. Before we move on to focusing on the next big thing, perhaps the Kanye x adidas collaboration, we should take a look back. Sure, some of the colorways of both the Air Yeezy and Air Yeezy 2 are less sought after than others (It is a tad bit easier to get your hands on the Net/Net Yeezys than it is the Black/Pink), but all of them sold out instantly when they released and fetch a high price on eBay. But, what of the Yeezys that never saw that retail push? Believe it or not, those are even harder to find, and if on the off chance you find a pair, some of the prices on them could make your head spin. Whether it be because they didn’t fit in with Nike’s overall release plans, Kanye himself wasn’t satisfied, or because these samples were just made for staging, there were several colorways that popped up on the web, some with more fanfare than others. Now that the Kanye x Nike saga is over, we have decided to go back and give some info about all of the most discussed samples to have ever hit the web. 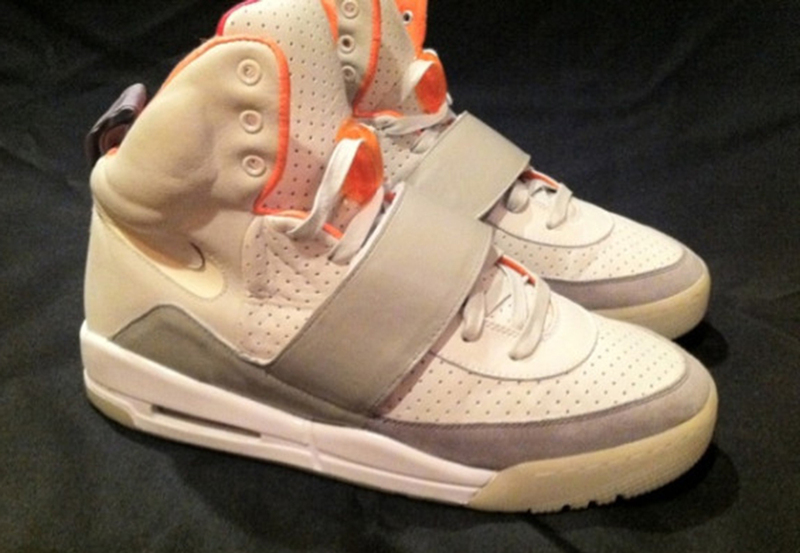 Before the 2008 Grammys, before the campouts began, there was this; the original prototype for the Nike Air Yeezy. 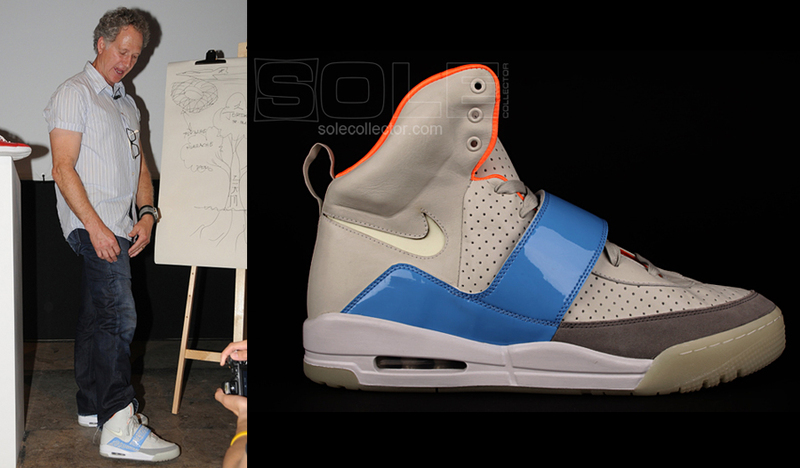 The basic design is very similar to the Air Yeezy we know today, with the biggest difference being the tooling used. 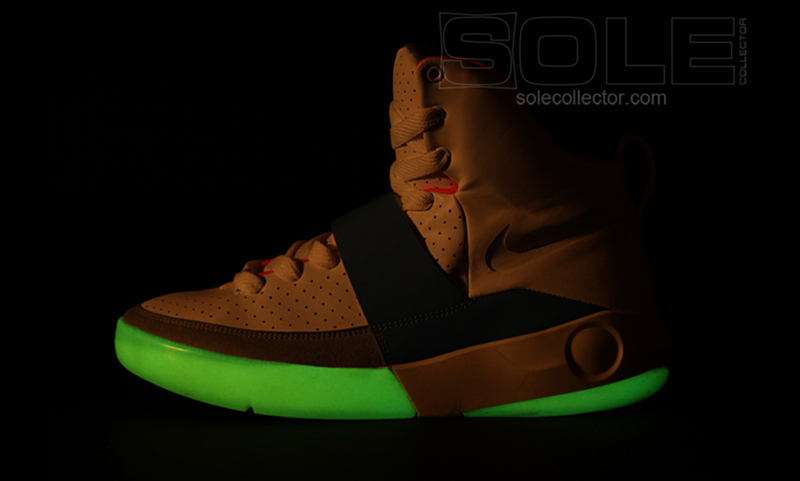 Originally, the Yeezy featured “Death Star” tooling, named for the semi-sphere used on the midsole. This tooling also feature the “Y-Print” on the outsole which originally used LED lights, but after the realization of the high cost of the lighting and the low battery life, the tooling was replaced with a glow in the dark version of the Air Assault tooling. The first sample we saw was the one that started it all. When Kanye West took the Grammy stage in 2008, he launched the crowd into an uproar with an energetic performance of “Stronger”, complete with an LED infused outfit. After Daft Punk retreated to the inside of their pyramid, the house lights grew brighter, and Kanye started performing “Hey Mama” as a dedication to his mother who had passed away earlier that year. After the audience wiped their eyes, and the Grammy Awards continued, the internet starting going nuts trying to figure out what Kanye was wearing on his feet. 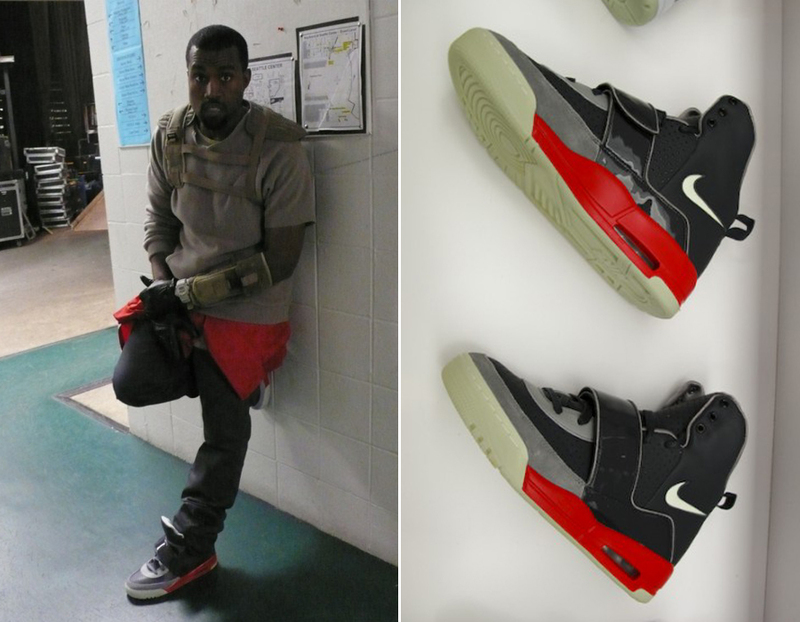 After awhile, it became clear that Kanye was in fact wearing his own Nike signature model, making him the first rapper to ever do so. 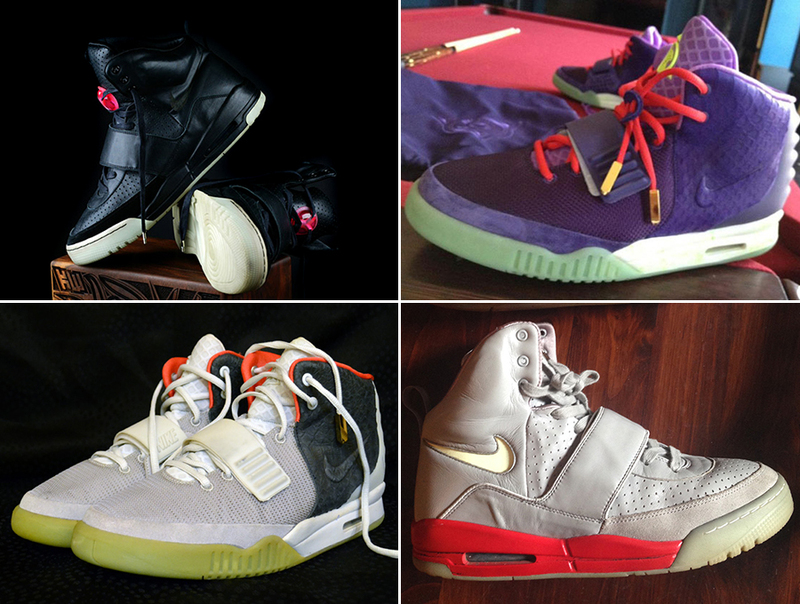 Thus began the Yeezy craze. About a year later, during a comedic series of videos featuring Mark Smith and Chi McBride, it was announced that the “Grammy” sample would be sold via a Nike/Doernbecher charity auction on eBay to benefit that children’s hospital that Nike has long partnered with. The pair sold for over $10,000, and years later actually hit eBay a second time, although details on this second auction are scarce. This sample, created in Nike’s Innovation Kitchen, was made when Mark Smith was testing various different kinds of tooling on the Yeezy. Kanye wanted to use Jordan tooling on the Yeezy, but Nike would not allow it, so even though this sample was created to see how a Yeezy would look on Jordan tooling, it was never presented to Kanye as an option. 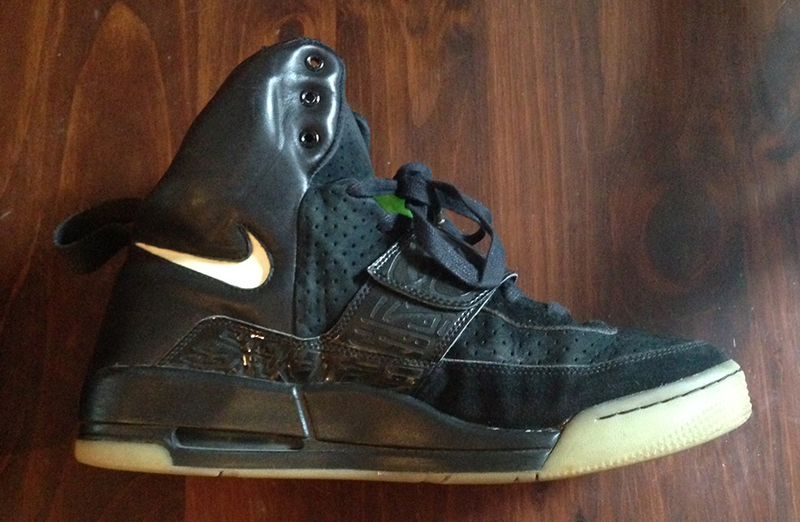 This pair, like the “Grammy” Nike Air Yeezy, was sold as part of the 2009 Nike/Doernbecher charity auction. 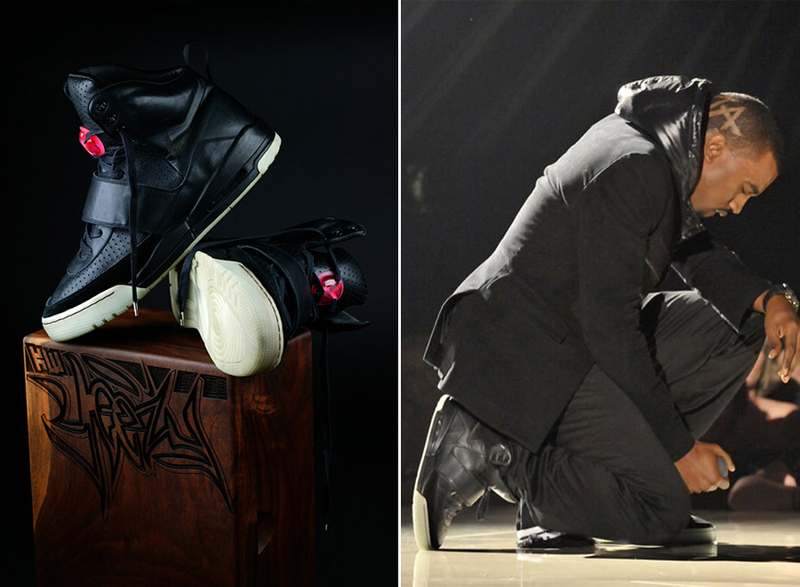 The shoes sold for slightly less than the “Grammy” pair and haven’t popped up on eBay since. 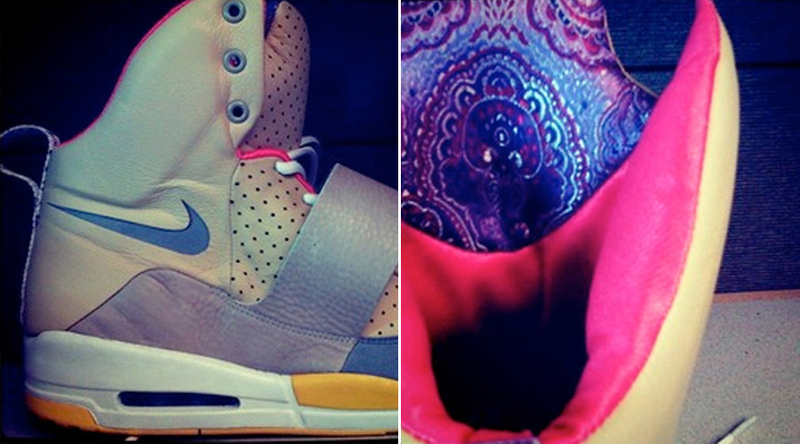 It appears that the infamous “Cheetah” Yeezy 2 was not the only Kobe inspired Yeezy colorway. 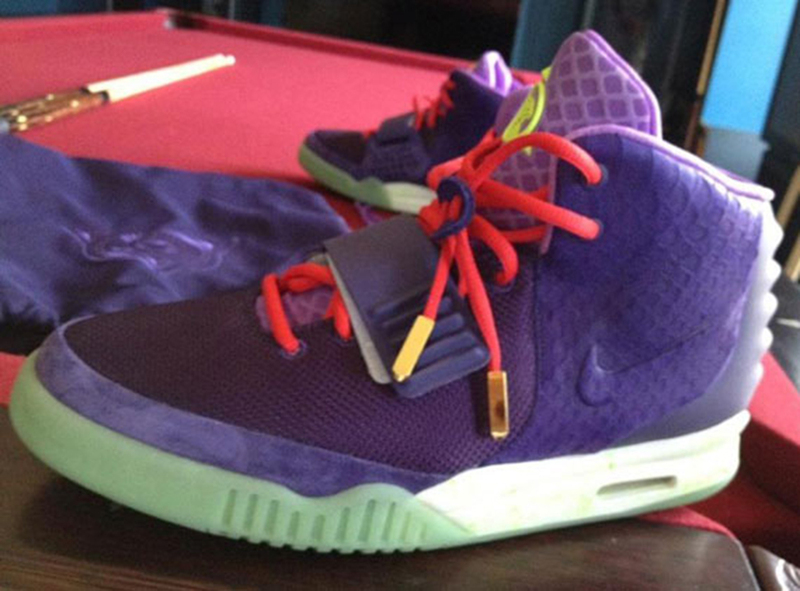 In a recent Sneaker News interview with GLC (Chicago rapper and best friend to Kanye West), it was revealed that one of the first Yeezy samples ever created was a Lakers-inspired purple and yellow colorway that “never saw the light of day”. According to GLC, Kanye was so upset with the colorway when he saw it that he “ripped out the tongue” and went to extremes to destroy them so nobody would ever associate them with him. This is almost certainly the Yeezy sample that the least amount of people know the details about. It appears to be a material and color test sample, that loosely resembles the Net/Net colorway that released. The two most unique features of the shoe are the graphic that is used behind the tongue, and the two tone midsole. After everything Tinker has done at Nike, he certainly deserves his own pair of Yeezys. Seen on his feet only once, Tinker was given this pair of predominantly Zen Grey Yeezy samples that featured an intricate lasering design on top of an eye-catching blue patent leather strap. It should be noted that we have also seen a very similar sample, that was considered for production, but ultimately scrapped. This sample, pictured above, wears the same colorway, yet does not feature the lasering present on Tinker’s pair. It is unclear whether or not these are two separate samples, or rather the same sample just at different stages. Owner: Tinker Hatfield, Nike inc. Originally given to Chicago rapper GLC during a visit to Beaverton with Kanye, this sample features the same kind of lasering used on Tinker’s sample, only on a much simpler all black upper. The sample is said to be the first sample to be graced with a lacelock. The upper is entirely black with a lush suede used on the tongue and toe box, and a leather used on the back panels. It is rumored that the lasering was being considered for the production versions of the shoe before elephant or “Y-Print” were considered, but this hasn’t been confirmed. GLC, the first owner of the sample, stated in an interview with Sneaker News that he was given the pair by Kanye after he had received two black Yeezy samples during a visit to Nike headquarters. Kanye said that he didn’t need more than one black sample, so he gave the other to GLC. 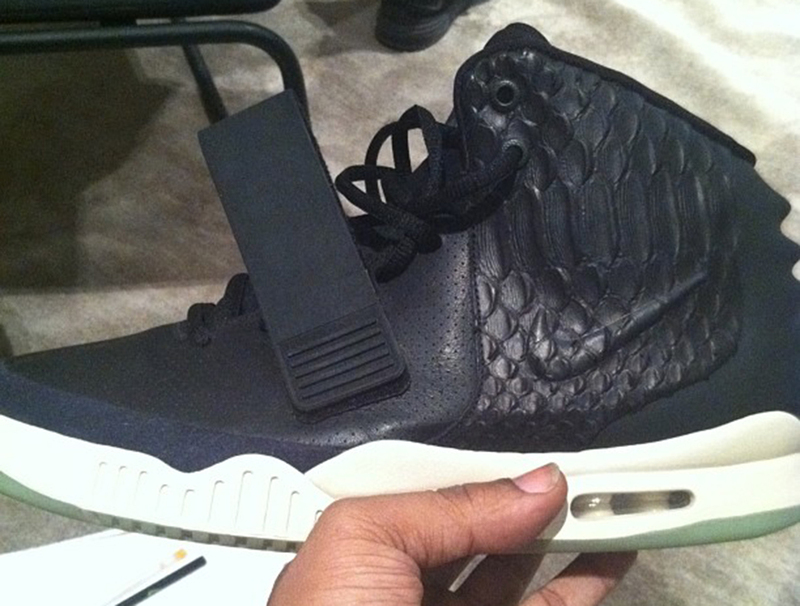 By far the most common of the unreleased Yeezys is this black and white sample. The upper is very similar to the “Laser” sample, featuring an all black, suede and lather upper. Both the swoosh and sole glow on these, but they actually glow different colors. While the sole glows the traditional green, the swoosh glows a very light blue. The final all black sample that we saw was the “Neoprene” sample, which featured an all black upper and neoprene on the toe box. Clearly Mark Smith and Kanye both approved of the neoprene use, since that same material was used in the same place on the Black release colorway. Owner: Kanye West, Nike Inc.
Nicknamed the “Bone” sample by those who got their hands on it after Kanye, this sample was created for color testing purposes. It bares a striking resemblance to the Zen colorway of the Yeezy 1, mixing greys and whites on the upper with pink and orange on the inner lining. Kid Cudi was seen wearing these samples in late 2008. In the video he mentions that they are a 1-of-1. Considering that this pair made its way through several hands and hit the resale market, either this sample is a 1-of-2, or somehow, Cudi’s pair made its way into other hands. This Yeezy sample, also a result of color testing, has many unique features that have not been seen on any other Yeezys. Firstly, the “Yeezy” branding is only featured on one of the two pull tabs, and it is aesthetically different than the branding used on the release versions of the shoe. There are also only two eyelets at the top of the upper as opposed to the three that are on all of the other Yeezys. Lastly, this sample features a “split sole”, mixing red and glow in the dark to make a very unique outsole. Though this sample, which is being sold currently on eBay, has long been rumored to be an early predecessor of the “Grammy” pair, that has not been confirmed. The final pair of color test samples that hit the market was this grey and red Yeezy sample. The shoe features a smaller than normal backtab and piping around the strap, but other than that, this sample features no abnormal structural changes. Some nicknamed this pair the “Jasper” sample, due to the fact that the color blocking is similar to that of the Louis Vuitton Jasper. 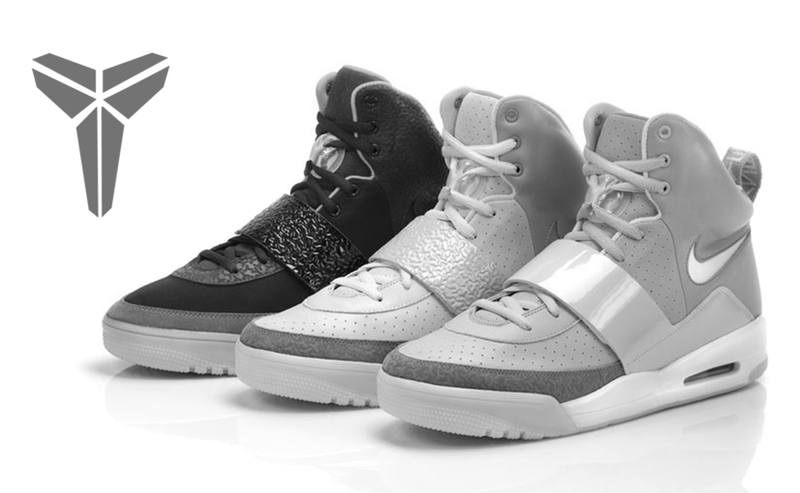 After all of the color testing and changes to the silhouette, Mark Smith and Kanye finally settled on 3 colorways: a “Net” colorway that was mostly the brainchild of Mr. West, a “Black” colorway that reflected more of Mark Smith’s taste, and a”Zen Grey” colorway that was mostly collaborative. After the 3 colorways were decided on, one final round of test samples were made before the production versions. Each of these Final round samples features characteristics that were changed before release. For instance, the “Zen Grey” colorway has a glowing swoosh, and the “Black” colorway uses glow in the dark laces and a plain black patent leather swoosh. One of the most celebrated Yeezy samples ever is the “Fire Red” Yeezy. A classic colorway, the shoe features a mix of black and grey on the upper with a bright, fire red midsole serving as a loud accent. 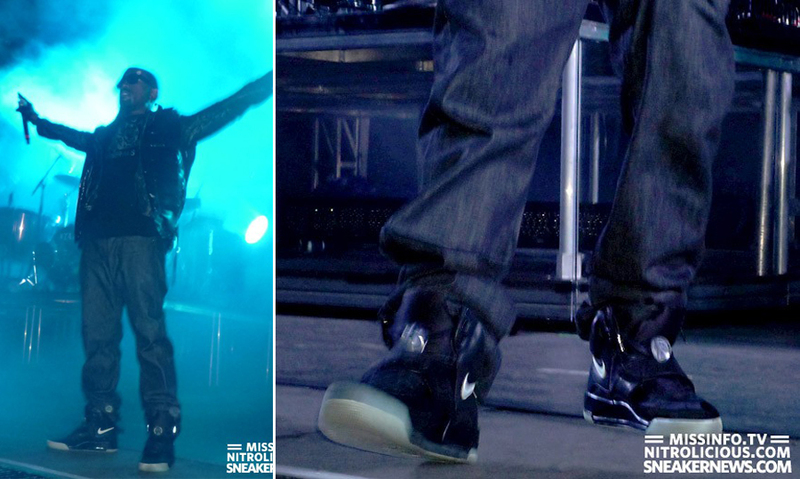 The shoes have been seen on Kanye many times, the first being all the way back during the Glow in the Dark Tour. What truly makes this sample stand out among the others is the potential that it had because it was, at one point, considered as a release colorway. Some say that it would have replaced the Net colorway, but rumor has it that the plan was to release the “Fire Red” Yeezy as a fourth colorway at the opening of Kanye’s first Pastelle store in Chicago, however, when the company folded, Nike scrapped the sample. Because this colorway was considered for release, there are believed to be several pairs floating around. This sample has been seen a few times, but most notably on the feet of Nike’s Tiffany Beers during the unveiling of the Nike Air MAG 2011. Not much is known about this sample, but it is rumored to be another scrapped colorway, featuring a luxurious gold graphic on the liner that is similar to the “Graphic Tongue” sample. 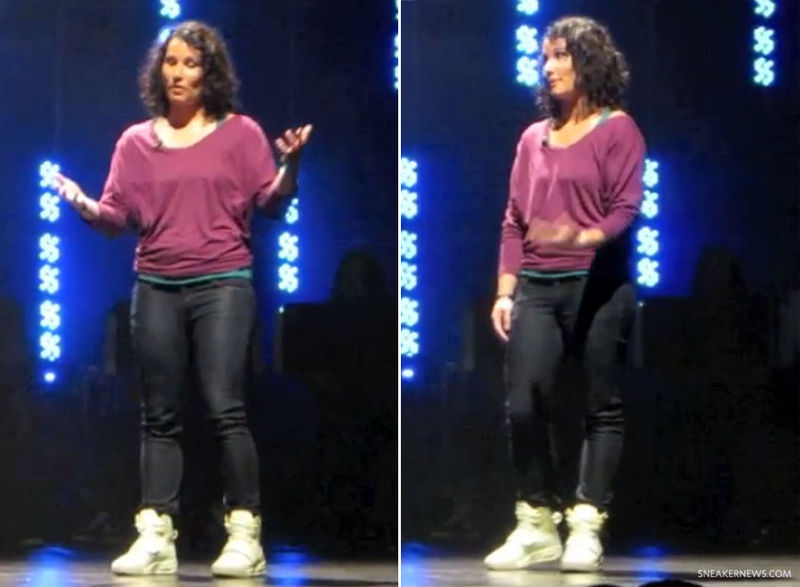 Owner: Tiffany Beers, Nike Inc.
As many remember, the premiere of the Nike Air Yeezy 2 came in the form of a Kanye guest spot in a “Black Mamba” promotional video. 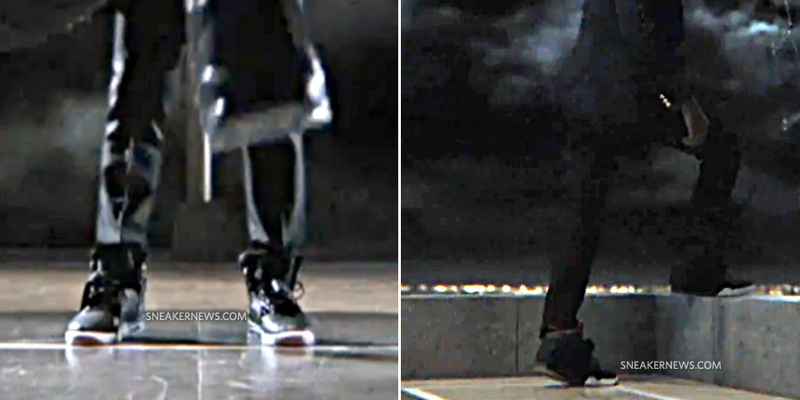 Most believe that the sample featured in the video is the “MBDTF” Nike Air Yeezy 2 sample, but if you look very closely, you can see that Kanye is actually wearing a prototype in the black/solar red colorway. Early sketches of the Yeezy 2 reveal that the shoe originally featured a “foamposite bootie” that is visible in the “Black Mamba” video. The shoe that started the second round of Yeezy craze was this black/off-white sample, designed during the recording process of Kanye’s acclaimed album “My Beautiful Dark Twisted Fantasy”. When they first hit the Coachella stage in 2011, many were watching the live-stream of the performance with their eyes glued to the screen. Several days and grainy performance photos later, Kanye was seen around Paris with the sample, and the hype began to build. When pictures of the “Cheetah” Yeezy 2 (also nicknamed the “Kobe” Yeezy 2 by many) first hit the web, they were followed closely by a rumored release. The colorway is inspired by the “Christmas” Kobe 8, and follows it rather directly, using a mainly purple upper with red and volt accents. Supposedly there are about 3 pairs of these floating around, but nobody seems to know who has their hands on them now. 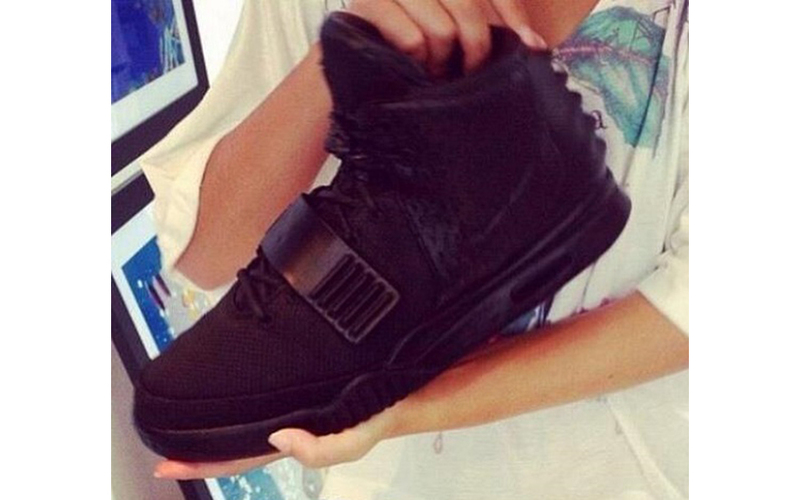 Showing up only once, in grainy snapshots of a look-book, was this “Oreo” Yeezy 2. Rumored to be considered as a third colorway around the time of the release of the first two colorways of the Air Yeezy 2, it now appears that this sample isn’t going to see retail shelves. This sample stands out as it bares no similarity to the Yeezy 1 colorways that released, and shows what many would consider clear Jordan inspiration. 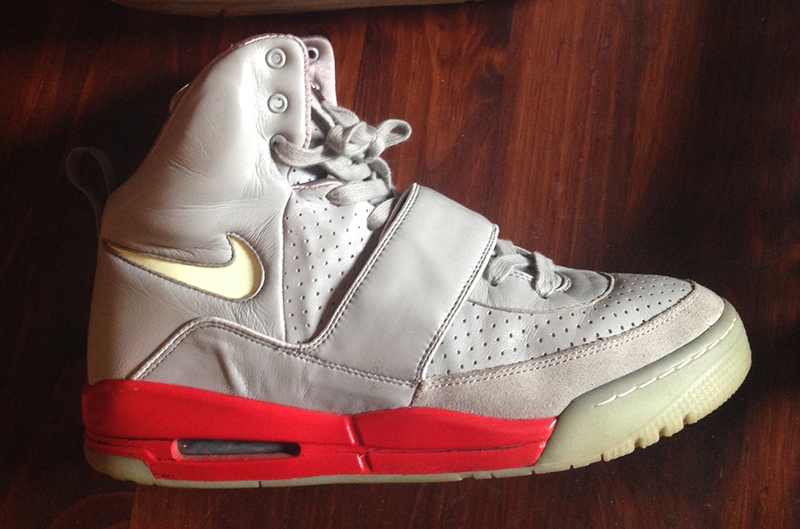 Seen, but for some reason never mentioned, is this “Silver” Nike Air Yeezy 2 sample. Shown in the same mysterious photos as the “Oreo” Yeezy 2, it seems that this Yeezy with a silver toe box was simply over looked. Like the “Oreo” Yeezys, the “Silver” sample marks a departure from the Yeezy 1 colorways and very little is know about it. Early on in February, Sneaker News broke out a Select feature on a never-before-seen sample of the Air Yeezy 2 from the closet of collector S. Sami. 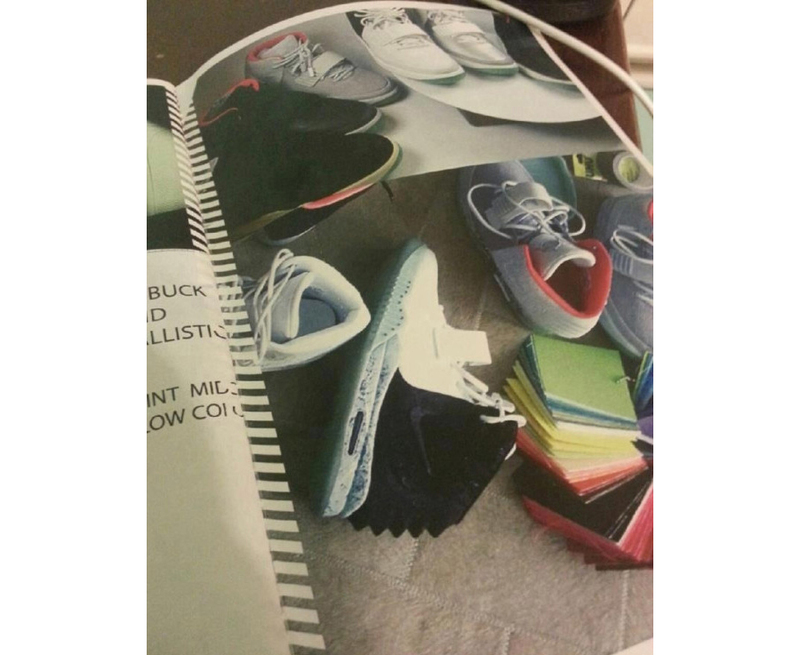 The sample was created as a potential third colorway, and is essentially a remix of the first two colorways. Kanye liked the colorway, but Nike believed that it was too similar to the other two colorways, and decided to go with the “Red Octobers” as the third release of the Air Yeezy 2. The final Yeezy samples in this list do not come last because they serve as a grand finale, but rather because, maybe, they should have been left off of the list altogether. When the “Blackout” sample first hit the web, it was met with relatively little fanfare and discussion. One of the many reasons for this is that the authenticity of the pair cannot be confirmed. None of the usual suspects of Yeezy sample collectors and sellers have ever heard of this sample from anywhere other than the source of the photos, DJ Folk. 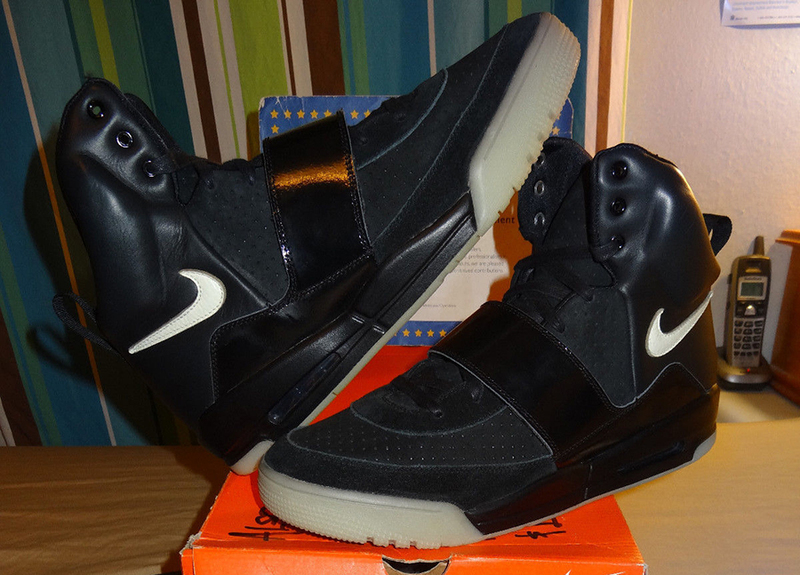 The status of the owner would lead many to believe that they are samples, but the glossy nature of the strap and the strange look of the laces have led some to believe that this is simply an authentic Air Yeezy 2 that someone covered in black paint. 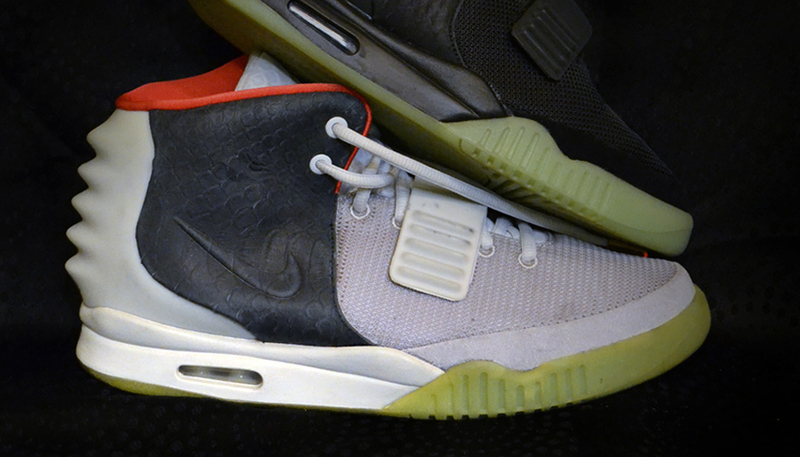 The “Black/Grey” Air Yeezy 2 has essentially the same story as the “Blackout” sample. Very little is known about them and their authenticity cannot be confirmed. Because many consider them to be real they have been included on this list, but it should be noted that in the photo of the sample above, the bottom of the outsole appears to be green and not grey, suggesting that these are at most a custom.